I like to fly kites. There are many web sites that allow you to download kite plans, so you can make your own kite fairly easily. 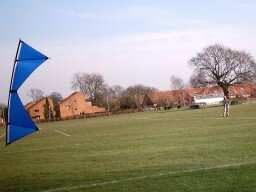 Have a look at Peter Peter's kite site for lots of information about kites including lots of good plans. I've made a freedom 2000 - here's a picture of me flying it. 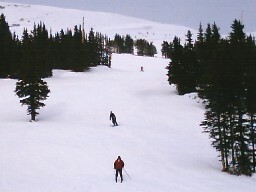 I recently went skiing at Marmot Basin, near Jasper in Canada's Rocky Mountains. It was great fun and I'll definitely be going again. I sometimes do some wood carving in my spare time. I've made two mancala boards (a kind of board game a bit like backgammon). This one was made from an old door sill I found. I like engines: steam engines, piston engines and jets. Some of the less common designs are particularly interesting. Something that has captivated many inventors is the idea of a rotary engine. One particular rotary engine design that has been proven and continually developed is the Wankel engine (developed by Mazda and used in their RX-8). Unfortunately, there are a few problems inherent to many rotary engine designs (and there has been no shortage of them), notably sealing, wear and cooling. Cleopatra 2525 was great. An exotic dancer from the 21st century is accidentally cryogenically frozen while getting breast implants(!) and then thawed out in the year 2525. She awakes in a world where robots rule the surface of the earth and humans live underground. She joins two women and together they fight to save humanity. Key features include robots, lasers, and many skimpy outfits! Sign the on-line petition to bring Cleo back!